You might recognise Grinexx as one of the dungeon bosses from the latest Zelda game: A Link Between Worlds. 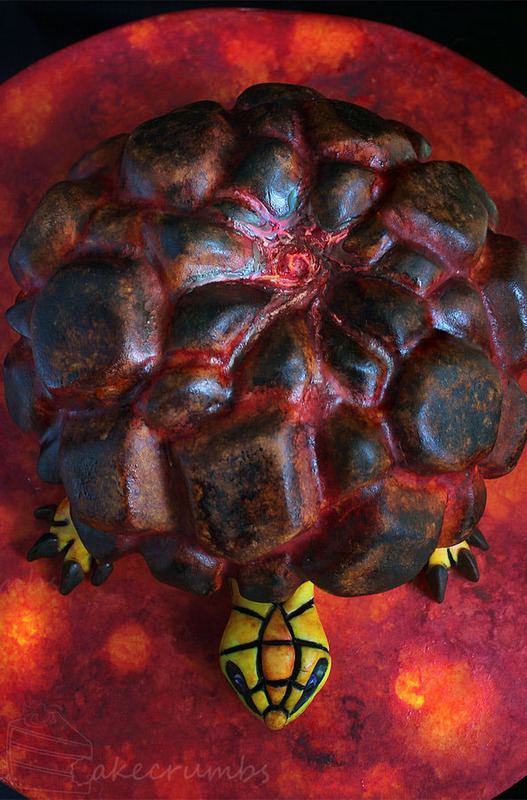 He’s basically a giant lava turtle (probably tortoise) that greets you at the end of Turtle Rock. And as soon as I saw him, I knew I was going to have to turn him into a cake. The basics are that his shell was made from chocolate cake, covered in ganache and then in fondant. The head and feet were sculpted from fondant. Then it was all painted with food colouring. Trickiest part of this cake was covering his rocky shell in fondant. There were a heap of corners and divots the fondant needed to be very quickly shaped around and I was totally shocked when I managed to achieve it first try without a single tear in the fondant. It was a lovely milestone for me to stop at and thing about my progress with this medium, as it’s something I would have badly struggled with not so long ago. 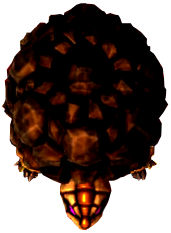 The Grinexx dungeon Boss of the Turtle Rock in Zelda: A Link Between Worlds looks and behaves relative similar to Trinexx back in Zelda: A Link to the Past but the battle is split into two parts this time. Link has to care a lot about the hot Lava environments this time and has to use the Ice Rod a couple of times to get Grinexx on the platform where the battle continues and Link can attack the boss with his Sword. Grinexx is guarding the portrait of the sage Impa.